World Wide Waftage - Wafting Through Our World Wide Travels with Ease, Joy and Simplicity: Part 1...Another day in paradise...Family style...Sightseeing! More family photos! Part 1...Another day in paradise...Family style...Sightseeing! More family photos! A fascination with caves always draws my eye across long distances. This photo is similar to a cave photo we took in Madeira when we went whale watching. Tom and TJ at OnomeaTrail. More family photos will follow in the next few days. Yesterday morning, the six of us took off on the road to visit several locations; Onomea Trals, Akaka Fall State Park and Honomu Black Sand Beach. View through the trees at the Onomea Trail. We decided to stop at the Onomea Trails first, then head to Akaka Falls, ending at the beach. If the sun was shining we could lounge on the sand on our beach towels and watch the surfers in this popular for locals, surfing beach. The scenery was amazing as is the case of many areas of the Big Island. After an a few hour drive stopping along the way for the amazing four mile scenic drive on Onomea Trails, we arrived at Akaka Falls paying the $5 per carload entrance fee, reasonable considering the beauty awaiting us. This is a beautiful area, well worth the visit. "Akaka Falls State Park is a state park on Hawaiʻi Island, in the U.S. state of Hawaii. 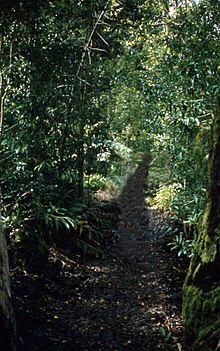 The park is about 11 miles (18 km) north from Hilo, west of Honomū off the Hawaii Belt Road (route 19) at the end of Hawaii Route 220, 19°51′15″N 155°9′9″W. It includes ʻAkaka Falls, a 422 feet (129 m) tall waterfall. ʻAkaka in the Hawaiian language means "A rent, split, chink, separation; to crack, split, scale". The accessible portion of the park lies high on the right shoulder of the deep gorge into which the waterfall plunges, and the falls can be viewed from several points along a loop trail through the park. Also visible from this trail is Kahūnā Falls. Local folklore describes a stone here called Pōhaku a Pele that, when struck by a branch oflehua ʻāpane, will call the sky to darken and rain to fall. Lehua ʻāpane or ʻōhiʻa ʻāpane is anʻōhiʻa tree (Metrosideros polymorpha) with dark red blossoms. ʻAkaka Falls is located on Kolekole Stream. A large stone in the stream about 70 feet (21 m) upstream of the falls is called Pōhaku o Kāloa." The Oopu alamoo is an endemic Hawaiian species of goby fish that spawns in stream above the waterfall, but matures in the sea. These fish have a suction disk on their bellies that allows them to cling to the wet rocks behind and adjacent to the waterfall. Using this disk, they climb back up to the stream when it is time to spawn. As we began the .4 mile hike up and down numerous steps, Tom and I found ourselves wrapped up in the exquisite vegetation along the way, his keen eye never missing an unusual plant or flower, many of which we'll share over the next several days. A point off the rocks. Palm trees growing new leaves. A billy goat we spotted on our long drive! Sarah, Jayden, Nik and TJ at Akaka Falls. Enjoy our photos as we continue to enjoy daily life with family on the Big Island. As for the lava flow, in the next few days a viewing area will be opened and we'll be there as soon as it does. Tomorrow, Akaka Falls State Park photos and whales! After our first sunset game drive in Kruger National Park, seeing very little wildlife on that particular occasion, we went to our first Bush Braai, hosted by Louise and Dani, our fabulous hosts during our three month stay in South Africa. (The humidity was so high the camera lens was spotted which I failed to notice). Guards with rifles surrounded the perimeter to protect us as we dined on lovely food with gorgeous place settings. This was our first Bush Braai and I kept using my little flashlight checking for scorpions. After about our fourth Bush Braai, I finally stopped looking. Oh, how we adapt in time. For more details, please click here.